Last weekend was Valentines Day and I decided to cook up something special for my Hunny Bunny. 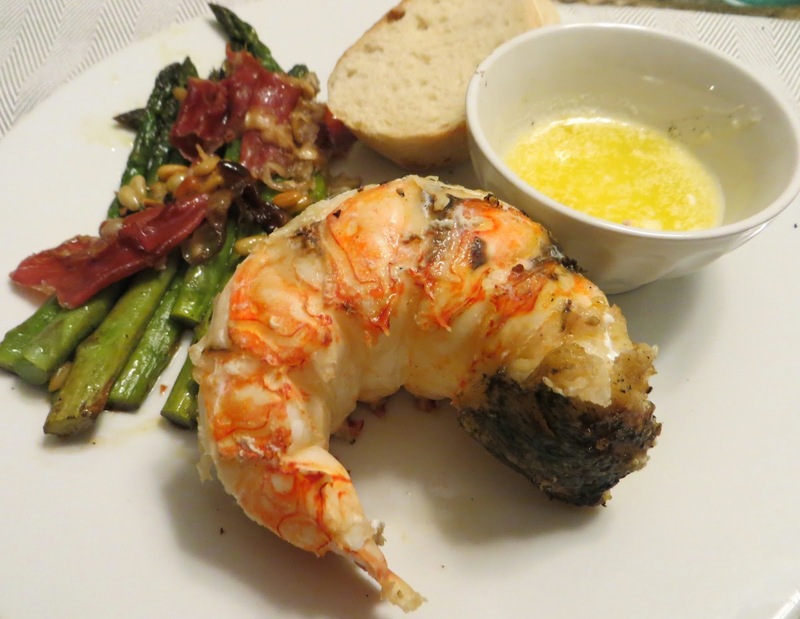 Cheryl has been threatening me with divorce if I don’t make smoked lobster for her birthday, so I thought I would surprise her and make it a whole month earlier. Kind of like a little insurance, if it’s good I’m off the hook, if not I’ve got another month to regroup and cook it again on her birthday. I think she’s pretty serious about this divorce thing. I was at my favorite store in the world, Costco, and saw some really nice, big lobster tails. These were some big freaking tails, you know the kind you would pay $50 in a restaurant for, only this package of 2 was $25. I consulted my Myron Mixon cookbook for the recipe. It was so simple that I felt really stupid for not doing it sooner. Start by splitting the tails down the middle and season with olive oil, salt and fresh cracked pepper. Be sure to pull the shell apart a little bit and season all the meat. 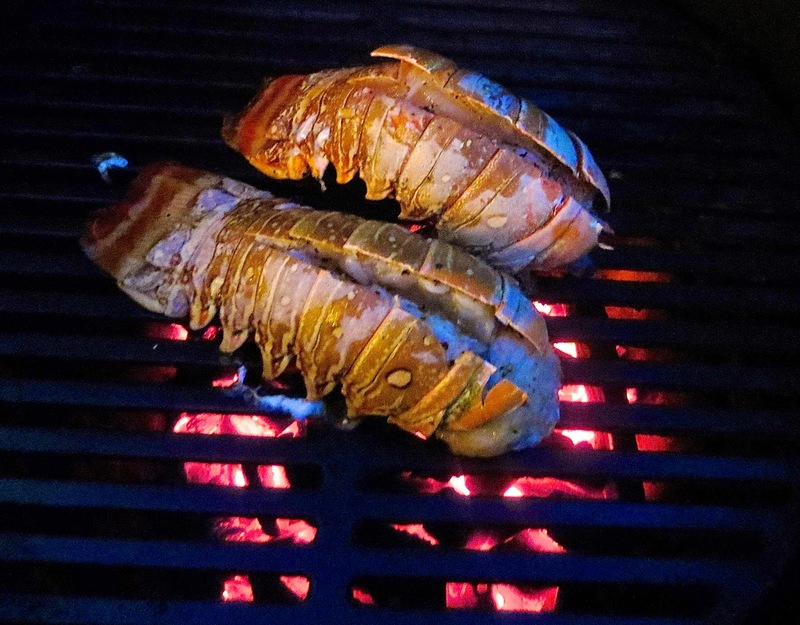 Lobsters cooking on the Big Green Egg. I heated up the Big Green Egg to 350º. 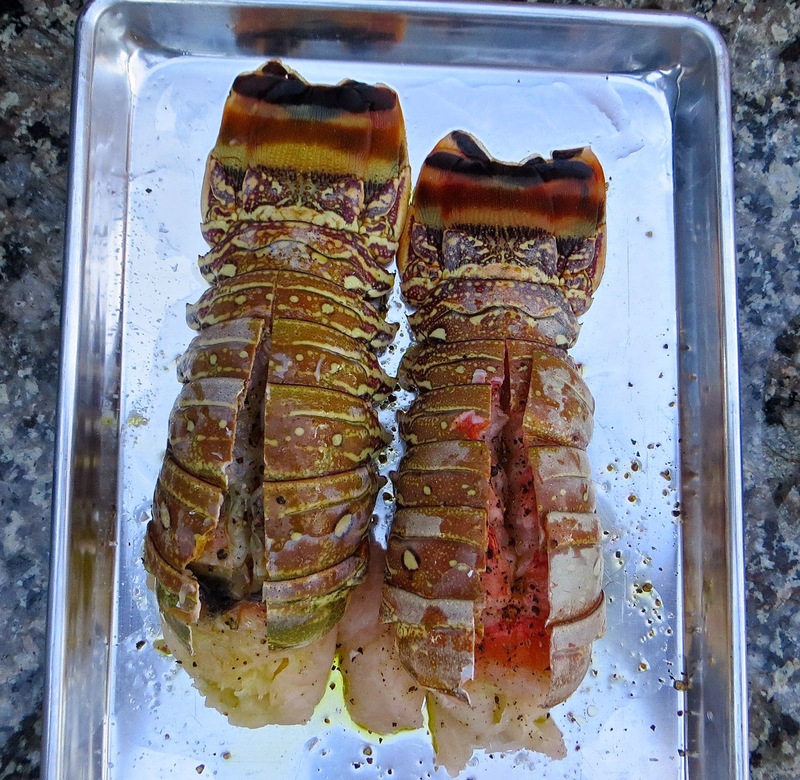 Since lobster is a fairly delicate meat, I used a mix of oak charcoal and pecan wood chunks for a light smoke that would compliment the flavor and not overwhelm it. Once the grill was up to temp, I placed the tails on the grate and cooked over direct heat for 20 minutes to reach an internal temperature of 140º. I plucked those bad boys off the grill, removed the tails from the shells and served them immediately with melted butter. How easy was that? The lobster was absolutely delicious. It was sweet and tender with just a light smoke flavor. 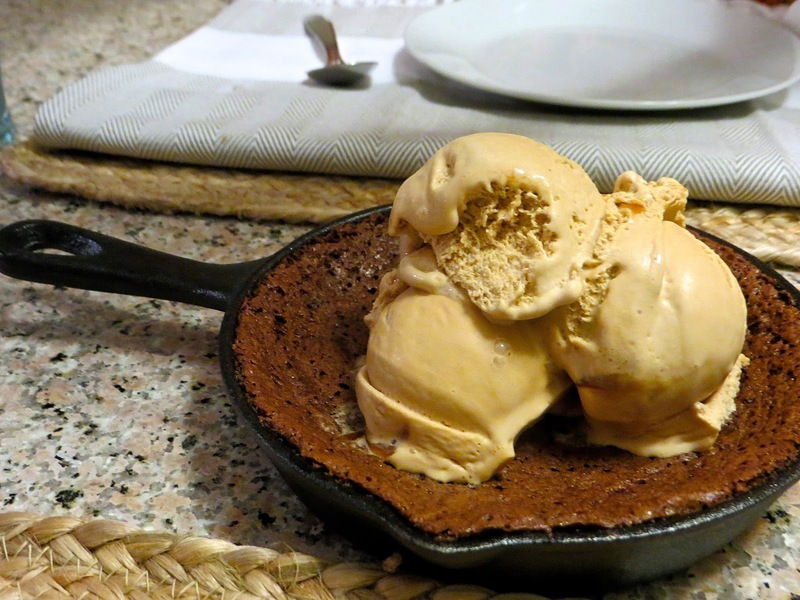 My Hunny Bunny was so happy she made us this lovely dessert, a brownie skillet with salted caramel gelato. I think I might have avoided divorce for at least the remainder of this year, but I’m pretty sure I’ll be cooking the lobster again for her birthday in a month. Not much to improve upon here, but a nice juicy steak on the side couldn’t hurt. A little surf and turf is a beautiful thing! It’s not Valentine’s Day with out chocolate.